Botanist and neighbor, Minnette Marr, took members of the San Marcos Greenbelt Alliance on a walking tour of Prospect Park, a 45 acre section of Purgatory Creek Natural Area, to discuss plant diversity, invasives, and water quality. This is the third time she has donated her expertise to advising the membership the direction we need to go. of opening up the area around the karst features. The two-hour hike consisted of progress made since last year’s Bobcat Build when Inge’s Bench and Metz Bench were opened and viewsheds were established for visitors. 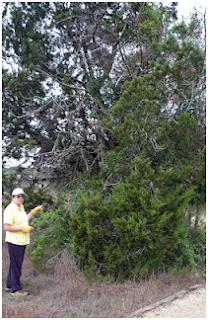 The small meadow with prickly pear cactus were examined for evidence of native grasses taking hold. Unfortunately, no new grasses had established themselves. Much of the ligustrum (glossy privet) was cut down and opened up new areas around the two karst features. A new karst feature was located following the 6+” rain of January 25th, 2012. More light into the area allows native plants and grasses to take hold and send more rainwater into the Edward’s Aquifer. Future rains will also be the focus of projects for this year’s Bobcat Build as new water bars will be constructed over the ADA trail and divert the flow from the trail to the ground. Repairs from the beneficial rains will also encourage more retention of the water and less run-off. The wetlands area had three active ponds that are graced with numerous wildflower borders. Bluebonnets once again are prominent in the meadows that Limbo Loop and Virgil’s Trail transverse. Further evidence can be found at Steve’s Bench and bur oak planted in his memory. prickly pear, and other plant. A row of bois d’arc or osage orange trees follow the trail to the Learning Tree. It looks promising that the seven trees will take hold and provide shade from the summer sun. An ashe juniper tree is surrounded by a dozen different plants and adds to the knowledge database. Further down the trail Mexican plum trees were planted to encourage birds and small mammals to feed on the fruit of the tree. Work on the meadow kiosk and two wildlife viewing stands were also discussed in the trail visit. 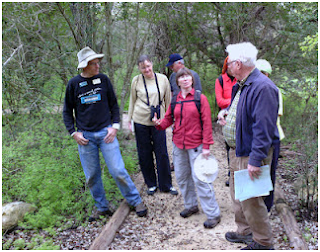 Prospect Park, as part of the larger 463 acres of Purgatory Creek Natural Area, is a microcosm of what is natural and what is introduced into the landscape. Previous use as a grazing area for cattle and goats and the use of invasive species as landscape plantings farther up the watershed cause issues and requires thoughtful resolution. The opportunity presented by having a large workforce available, even if just for a day, makes an impact for years to come. We are fortunate to have the advice and guidance of a local resident to preserve these areas and provide learning opportunities for future generations. The University program allows for strong backs and young spirits to enjoy community service.